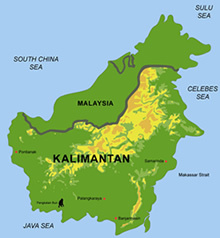 Vast areas of peat swamp forest (PSF) cover the coastal plains of Central Kalimantan from the Java Sea up to the provincial capital of Palangkaraya and further North. PSF is among the earth's most endangered ecosystem, with a huge carbon storage capacity ref.7+10, extremely fragile to disturbance. Landsat ETM images 118-61+62, acquired on 14.Jan/15.Feb2003, were compared by using detailed analysis of the region around the Tangkiling granite hills and the black water river Rungan north of Palangkaraya. These images show major changes in this largest remnant of tropical peatland related to extreme rates of deforestation and fires in 2002, since 1997, compared to older Landsat images from 1991/1997/2000, ref.3+4. 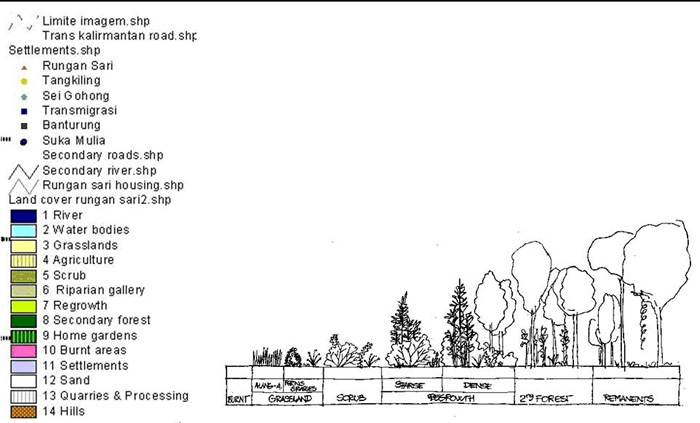 With the establishment of the Mega Rice Project (MRP) and the infrastructures of roads, many people were able to enter the previously inaccessible interior of this peatland landscape, exploit residual timber resources, mostly on an illegal basis, and using fire for land clearance as the most economical method. Ground truthing were done in this study area in 2004. 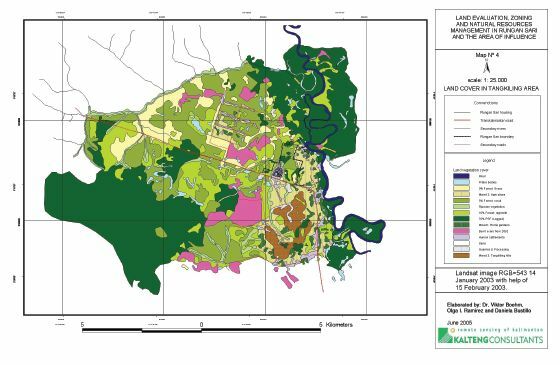 We analyzed several maps around the Tangkiling hills, Sei Gohong and Rungan-Sari with areas of PSF, grassland, agriculture, scrub, riparian gallery, regrowth, secondary forest, home gardens, burnt areas from 2002, settlement, sand, water bodies etc.